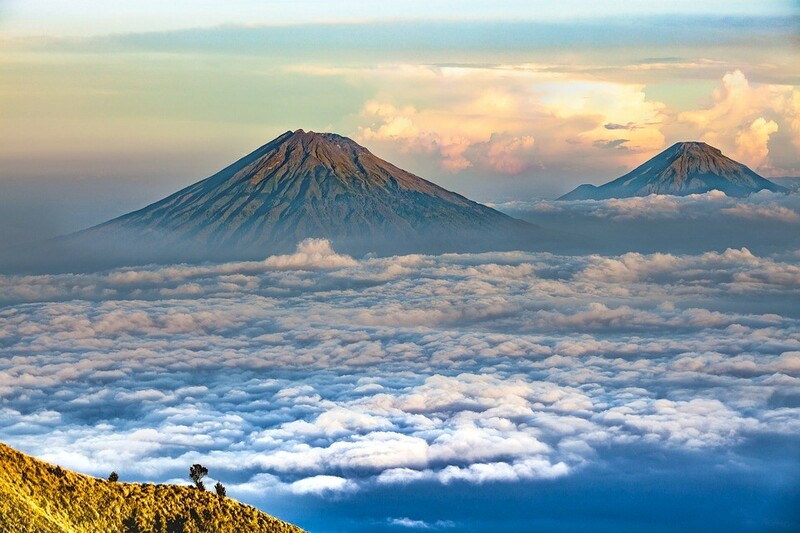 Indonesia has more than 400 volcanoes, including 128 active ones. The tallest, Kerinci on Sumatra, Rinjani on Lombok, and Semeru on Java, for example, reach more than 10,500 feet above sea level. The country covers one of the most volcanic and seismically active regions in the world. The volcanic ash yields extremely productive crops, which lures people to risk their lives farming in the shadows of these dangerous mountains. Thousands of farmers and their families have lost their lives as a result. These mountains lure hikers and mountaineering clubs. Adventure travelers from other countries also find these volcanoes worth the trip. Indonesia’s most famous volcano is Krakatau (known in the Western world as Krakatoa) in the Sunda Strait, between Java and Sumatra. When it blew up in 1883, the explosion and its after-effects circled the world. This volcano and many others have killed more than 150,000 people in Indonesia over the last 200 years. Mt. Tambora, Sumbawa: In 1815, it killed 92,000 people. This eruption was greater in size and power than the more famous eruption of Krakatau. About 10,000 people were killed directly as a result of eruptions and ash falls, while about 82,000 were subsequently killed by starvation and disease. Lake Toba formed in its massive caldera. Mt. Krakatau, Sunda Strait: Krakatoa erupted repeatedly over August 26-27, 1883. The northern part of the island vanished into the air and sea. It killed more than 36,000 people, mostly those who lived on the neighboring islands of Java and Sumatra. The massive tsunamis caused by the explosion surged 10 miles inland on these two islands to kill most of the victims. The explosions were heard 3,000 miles away and the shock was felt as far away as California, 9,000 miles from ground zero. Since 1925, this volcano has visibly been regenerating itself and is violently active again. Mt. Kelut, East Java: In 1586, Kelut (also called Kelud) erupted and killed about 10,000 people. Most of the victims were killed by lahars—violent mudflows comprised of volcanic ash and debris saturated with water from the volcano’s crater lake. In 1919, this volcano erupted again and killed more than 5,000 people. Mt. Galunggung, West Java: In 1882, this volcano erupted and killed about 4,000 people with mudflows and hot ash. Mt. Awu, Sangihe Besar Island in North Sulawesi: In 1711, Awu erupted and killed more than 3,000 people. In 1856, it erupted again and killed about 2,800 people. In 1892, it erupted again and killed about 1,500 people. In 1812, this deadly mountain killed another 960 people. Mt. Merapi, Central Java: In 1672, Merapi, which means mountain of fire, erupted and killed about 3,000 people. In 1930, Merapi erupted again and killed about 1,300 people in the valleys below. In 1994, a scorching heat cloud from the volcano killed 66 villagers and farmers living on its slopes. Mt. Papandayan, West Java: In 1772, this volcano killed about 2,900 people with its ash flows. Mt. 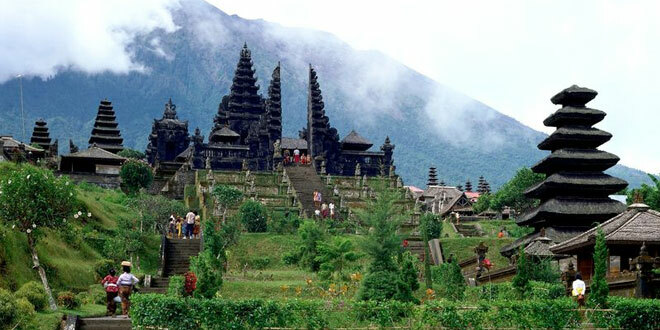 Agung, Bali: On March 17, 1963, an eruption blew the top off of the volcano and killed nearly 1,200 people. Agung is the island’s highest and most sacred mountain. Mt. 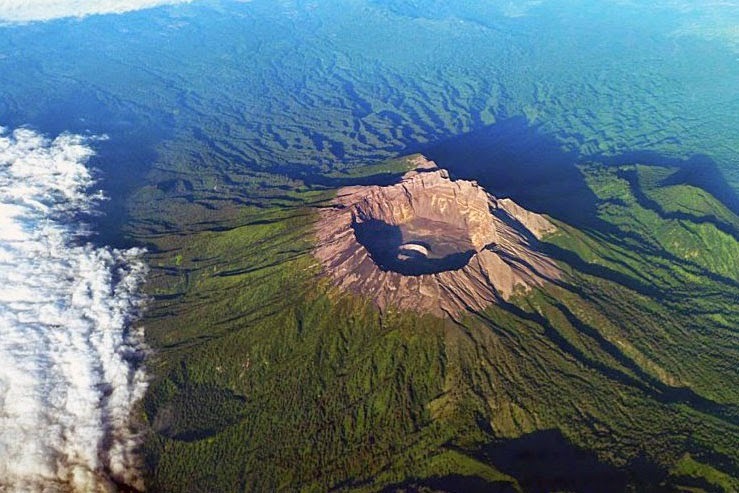 Raung, East Java: In 1638 this volcano erupted and killed about 1,000 people. This volcano is active again now and disrupting travel across Java and Bali. Mt. Iliwerung, Lomblen Island, which lies between Flores Island and Alor Island, East Nusa Tenggara Province: In 1979, this remote volcano erupted and killed about 500 people. Mt. Semeru, East Java: In 1965, Semeru killed more than 250 people. This is the highest mountain on Java. In 1981, Semeru killed another 250 people. Mt. Kelut, East Java: In 1966, Kelut killed more than 200 people. In 1966, Kelut killed another 90 people. Mt. Dieng, Central Java: In 1979, this volcano killed about 150 people. The Dieng volcanic complex in Central Java Province consists of two main volcanoes and about 20 smaller craters, several of which emit poisonous gas.